Protests were staged at a number of Yorkshire train stations on Monday over rail fare rises and the threat of job cuts. 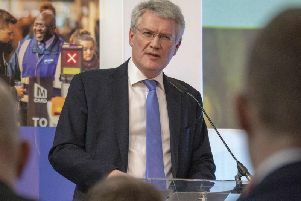 Rail union the RMT plans to continue its fight against reform following the New Year season ticket increases of 2.5 per cent which came into effect on Friday. Campaigning events took place across Yorkshire including at Harrogate station. The RMT opposes fare rises, the use of driver only operated trains, the closing of ticket offices, the lessening of staff at stations and cuts to the TransPennine Express (TPE) network. RMT general secretary Mick Cash said: “Our message is clear, the fight to stop the outrageous attack on jobs, safety and services under the Northern and TPE franchise plans continues in 2015 and the union is sending out the clearest possible signal to George Osborne, his Government and Rail North that they need to scrap this attack on transport operations and to cut the hot air about improving services when they are actually condemning the North to years of rail misery. The fare rises follow weeks of disruption to services, with problems compounded by over-running festive engineering work.